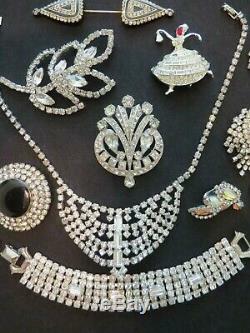 Vintage Antique Hight End Rhinestone Crystal Jewelry Necklace Earrings Bracelet Brooch Pin Lot. Materials: Silver Tone Metals, Rhinestones, Lucite Crystals, Plastic, Aurora Borealis. 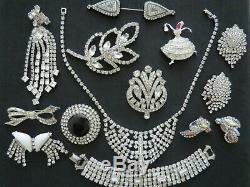 1 Vintage Silver Tone White Clear Rhinestones Set. Bracelet, measures: 1" width, 7" long, signed Weiss. 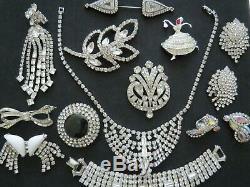 2 Vintage Silver Tone Sparkle Rhinestones Victorian. 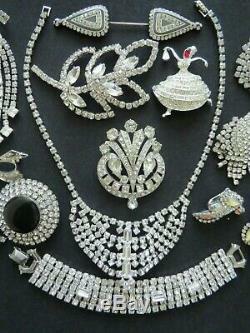 Large Brooches, measures: 2"x3 -1/2", 2"x 2- 1/2". 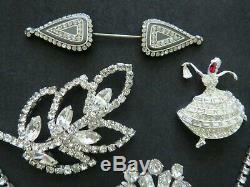 1 Vintage White Sparkle Rhinestones Red Crystal. Ballerina Brooch, measures: 1-5/8" x 2". 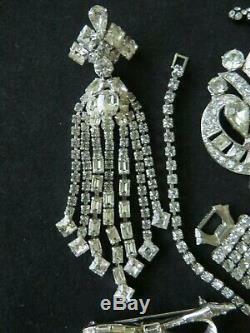 1 Sparkle Rhinestones Long Brooch, 4 1/4 long. 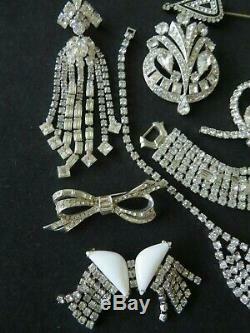 1 Vintage Rhinestones Bow, 2-1/4" x 1". 1 White Lucite Crystals Brooch, 2 x 1-1/2. 1 Circle Black Celluloid White Crystals Brooch. 1 Black with White Crystals Hat Pin, 4 long. 1 Silver Tone Crystals Clip on Earrings, 1- 1/2'x 2. 1 Aurora Borealis Clip on Earrings, signed Weiss. All of them are in good and very good wearable vintage condition. No pieces are broken, some show no significant wear. Some may need to be cleaned and or polished for your satisfaction. Please see photos for best description. Thank you for looking and feel free to ask any questions. 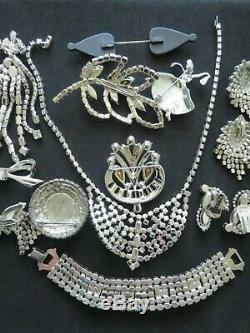 The item "VTG Hight End Sparkle Rhinestone Brooch Necklace Earrings Lot Weiss" is in sale since Tuesday, March 19, 2019. This item is in the category "Jewelry & Watches\Vintage & Antique Jewelry\Costume\Retro, Vintage 1930s-1980s\Pins, Brooches". 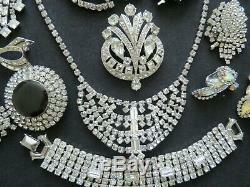 The seller is "marima196228" and is located in Austin, Texas.